There is significant misunderstanding about how marketing works – that is, of the mechanism by which it affects people’s attitudes, beliefs and behaviors. In particular, many scientists believe that they are immune to marketing’s effects. But if scientists are immune to marketing’s effects, why do so many companies continue to spend significantly on marketing campaigns? The reason is simple: this supposed immunity is just a myth; marketing actually works. To understand how, let’s examine the marketing mechanism of action. Many scientists believe that they are “immune” to the effects of marketing. They believe that their rational approach to the world lifts them above the attempts of marketers to influence their attitudes, beliefs and behaviors. Scientists are not alone – many in the general population believe they are “immune” to marketing and see these attempts at influence as pure manipulation. There is significant scientific, peer-reviewed research on this subject, some of which we examined in Vol. 1 No 2. This research shows clearly that marketing can indeed influence attitudes, beliefs and behaviors, whether you have a rational approach to the world or not. Given the power of marketing to influence audiences’ attitudes, beliefs and behaviors, shouldn’t we understand how it works? This issue will give you an overview. To describe the framework and various components of marketing, and how they function together, I’ve borrowed a term from pharmacokinetics: the marketing mechanism of action. In pharmacology, a “mechanism of action” is the specific interaction through which a drug produces its biological effect. Following this analogy, the Marketing Mechanism of Action is the specific chain of interactions through which marketing produces changes in audience attitudes, beliefs or behaviors. These are organized in concentric rings, orbits if you will, that start with your organization at the center and expand all the way out to your environment. Let’s take a look at each one in detail. 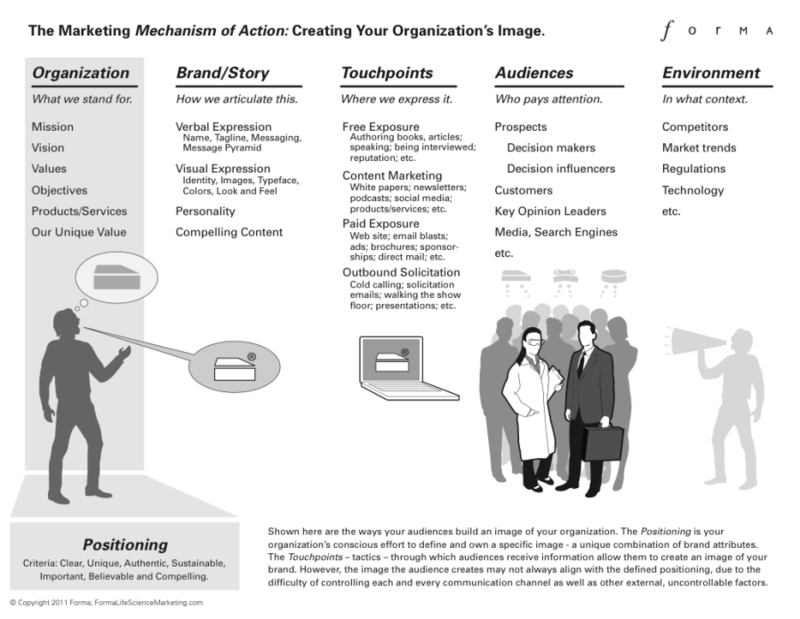 Figure 1: The Marketing Mechanism of Action is a model that describes the relationship between your position, your brand/story, your touchpoints, your audiences and your competitive environment. To create the desired image in the minds of the audience, it is important to manage each of these aspects carefully. At the center of each organization’s “universe” are its mission, vision, values and objectives. These beliefs are typically expressed through a strategic plan intended to inform and guide the organization’s actions and purpose. Internal alignment of those strategic elements within the organization provides consistency vital to the plan’s success. But to achieve success, something else is needed to complete the picture. In addition to a strategic plan – and optimally, as part of it – there must also be clear differentiation between your organization’s products/services and those of your competitors. Without differentiation, your organization and its offerings will be perceived as a commodity, which means you will lose pricing power. 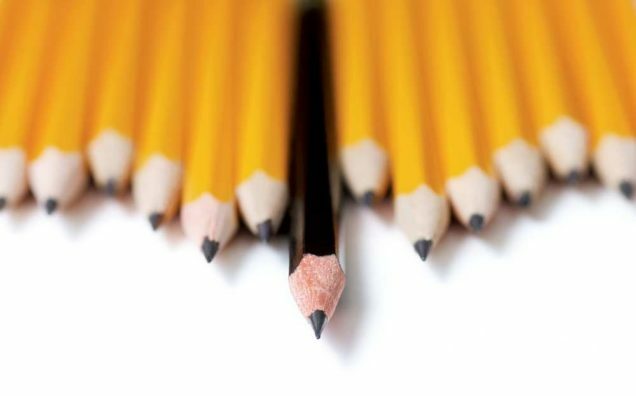 Successful differentiation – carefully chosen, clearly defined and embedded throughout the entire MMOA – creates a unique “space” in the minds of your audiences – a space that they associate only with you. The process of creating this unique space in the minds of your audiences is called positioning. If your position is the defined, unique space you decide to occupy in the minds of your audiences, the space you currently occupy there is your image. It’s important to understand the difference. The position is a choice you make; it represents the perception you want your audiences to have of you. The image is the perception the audiences actually do have of you. The position you select may or may not match your current image. In other words, what you want to be known for may not be what you are known for now. If that’s the case, don’t despair. There are many reasons for this and many ways to address it. But in every case, successful positioning leads to a clear, unique image, one with the power to influence your audiences’ attitudes, beliefs and behaviors. Successful (proper) positioning and internal alignment (consistency) provide the essential foundation for all effective marketing. Immediately outside the organizational center of your marketing universe is the next ring: that of the brand. Marketers are fond of buzzwords, and few words have as many different meanings as the word brand. One of the problems with the word brand is that one of the most common meanings refers to the visual representation of the company, such as your logo, your corporate signature or your trademark. This means that rather than representing the entire “public face” of the organization, the word brand has come to represent only the organization’s visual component. And to make matters more confusing, some marketers are abandoning the word brand for other words, such as narrative or story. We won’t take the time to clarify all the meanings of the word brand here. So, to ensure that we don’t think only of the visual part of public face of your organization, we’ll use the language brand/story to refer to your organization’s unique verbal and visual representations – its public face. To be successful, marketers must control their brand/story, ensuring that it aligns with the mission, vision, values, objectives and positioning of the organization. The brand/story must articulate the position of the organization. Touchpoints are those places where your audiences come into contact with your organization in any form (such as your brand/story)– where they touch. Touchpoints are avenues for your audiences to learn about your position and your brand/story; to be educated, inspired or reassured by your organization. In fact, touchpoints, by definition, are the only way an audience can learn about your brand/story. A touchpoint can be something obvious such as an ad, your website or a tradeshow booth. But these places where you and your audiences touch can also be more subtle – for example, an invoice, the packaging of the disposable portion of your product, the instruction manual or even a casual conversation with a salesperson on the floor of a trade show. All are touchpoints. Each of your organization’s touchpoints conveys a message, however subtle, about your organization and your brand/story. Thus, each is an opportunity to influence your audiences. Since each and every touchpoint is an opportunity to influence your audiences, to be successful your brand/story (which articulates your position), must be expressed consistently across all of them. In other words, all of your messaging as well as your visual appearance must be consistent and clearly related – otherwise you risk confusing your audiences. Without consistency, you’ll lose out on the cumulative effect that occurs as touchpoints reinforce each other, combining to shape your desired image in the minds of your audiences. You may have noticed that we have been using the word audiences (plural) rather than audience (singular). We say audiences because you actually have many different types of audiences besides your customers. And they all are bombarded by marketing messages, from you and your competitors. Your customers, while important, are only a small segment of the people who will come in contact with your brand/story. And customers are only a small segment of the people who will play an important role in your brand/story’s success. In addition to your customers, you are also communicating with your potential customers. And let’s not forget your investors and potential investors, your suppliers and potential suppliers, the media, your employees and potential employees, the regulatory agencies, even the postal carrier and other delivery people, the janitorial staff and any other people who happen to come in contact with your brand/story. But that’s not all. There also is a large set of digital entities that are paying attention to your touchpoints, such as the search engines that send out “spiders” to “crawl” across your web site, analyzing and interpreting your digital presence. Taken all together, these many groups form the audiences for your organization. Some will obviously generate more revenue than others; the key is to remember that you don’t have just one audience, you have many audiences. Now, “audiences” is not the perfect word, because it implies that all these different groups are sitting quietly in their seats, waiting for you to say something. Of course, nothing could be farther from the truth. The analogy works better if you envision them as a collection of middle-school students. They are all busy, chattering away among themselves or looking out the window, focused on any subject other than you. They have their own concerns. Getting their attention is not always simple or easy; holding it can be even more difficult. To be successful, marketers must understand the diverse needs of each of their audiences, and their relative importance. Marketers must have a systematic process of communicating with them and obtaining feedback from them. The outermost ring of the MMOA is the environment within which your audiences work – their business sectors. As part of the environment, there are other components such as your competitors, social influences, market trends, economic influences from both the sector and the world economy, technological changes, and the regulations that govern the industry, just to name a few. Each can affect the business success of your organization. To be successful, marketers must successfully navigate these changing environmental conditions while staying consistent in their brand/story as they attempt to educate, inspire and reassure their audiences. Your organization’s position is articulated in your brand/story, which is expressed through multiple touchpoints. The impressions from all these touchpoints are combined and distilled by the audience to create a specific image in their minds. This image can influence the audience’s attitudes, beliefs and behaviors, which also are affected by their environment. This seems simple, doesn’t it? It is, in theory. Start by picking a position. Articulate this position in your brand/story. Express this brand/story in your touchpoints. And finally, measure the images created in the minds of your audiences. Simple and straightforward. The reality of marketing is more complex. Successful marketing requires careful consideration of each of the components of the MMOA. The proper position must be carefully chosen, considering the fundamental values and vision of your organization, the business environment and your competitors’ positions. Your position should also meet seven key criteria to maximize its effectiveness: it should be clear, unique, authentic, sustainable, important, believable and compelling. Your brand/story must then express your chosen position clearly and succinctly. Your touchpoints must articulate your brand/story consistently, while making it accessible and compelling to your audiences. Your audiences’ attitudes, beliefs and behaviors should be measured and the knowledge gained should be used to modify some (or all) of the previous activities in the MMOA. The MMOA does not describe the internal processes by which audience members change their internal attitudes, beliefs and behaviors when coming in contact with one or more touchpoints. Such a description would venture well past marketing into discussions of psychology, personality and other behavioral sciences. But you don’t need to understand these subjects to find the MMOA useful. Specifically, the MMOA offers several important lessons. First, proper positioning is important. If you don’t choose a position that meets the seven fundamental criteria, your marketing will always be hamstrung. Second, this position must be clearly articulated in your brand/story. Without clear articulation, your audiences won’t understand what you are trying to tell them. Third, each and every touchpoint must express your brand/story consistently. This is particularly important for employees; each must understand the position of the organization and how it is articulated in the brand/story. Without consistency, your audiences will be confused. Fourth, you must understand your audiences. Ignoring one or more audience groups could threaten your ultimate success. The MMOA highlights the importance of uniqueness. As I said before, it is important to be seen as unique – otherwise you’ll be relegated to commodity status. To stand out from everyone else, you must show your audiences some uniqueness. This uniqueness can come from one of two areas on the MMOA: your brand/story or your position. These are no other alternatives that are viable in the long term. The more powerful option is to find and highlight the uniqueness in your position. Judging from the state of marketing in the life sciences, this is difficult. But for some companies, particularly for product-oriented companies or smaller, more service-oriented companies with a tightly-focused offering, finding and highlighting the uniqueness in your position is the most effective option, as this yields the clearest and most meaningful differentiation in the minds of your audiences. But in some cases, finding and highlighting the uniqueness in your position is not always possible, particularly for large, service-oriented companies (like many CROs, labs, etc). These organizations must find and highlight their uniqueness through their brand/story. There are many examples in consumer goods of well-known organizations that have to make this same choice. Think about Coke® vs. Pepsi® or McDonalds® vs. Chick-fil-A®. These organizations offer very similar products and services, yet they present themselves very differently to their audiences. They do this by creating and managing a unique brand/story. One key component of creating and managing your brand/story is to harness the power of design to translate your internal strategic position into a public-facing brand/story. Ideally, this involves a great working relationship with a designer or team that understands your uniqueness, your business sector, the buying behavior of your audiences, and the state of the art in life science marketing tactics, among many other things. In other words, someone who truly understands what it is you do, and who’s capable of going beyond the “pretty pictures” generated by a limited emphasis on aesthetics or creativity to create compelling and relevant communications. To illustrate the MMOA in action and to highlight the importance of uniqueness, it may help to examine the brief story of a fictitious life sciences company, SpeedyTech Corporation. You can read more here. Summary: The Marketing Mechanism of Action and the importance of uniqueness. The MMOA is a simple but powerful model that describes the relationship between the major components of your marketing efforts: your position and your unique value proposition, your brand/story, your touchpoints, your audiences and your environment. This model teaches us how effective marketing can be created. At the level of the Organization, care must be taken to ensure that the position meets certain specific criteria: it should be clear, unique, authentic, sustainable, important, believable and compelling. At the Brand/Story level, the position must be clearly articulated. At the Touchpoint level, the brand/story must be expressed consistently. At the Audiences level, the effectiveness of the touchpoints must be constantly assessed through monitoring of the audiences’ images of the organization’s offering. And at the Environmental level, monitoring of trends and competitors is crucial. While the MMOA is simple in theory, developing and implementing successful marketing requires strategic and tactical focus, with a deep understanding of how your position, your brand/story and your touchpoints all combine to influence your audiences. © 2013 Forma Life Science Marketing, Inc. All rights reserved. No part of this document may be reproduced or transmitted without obtaining written permission from Forma Life Science Marketing.